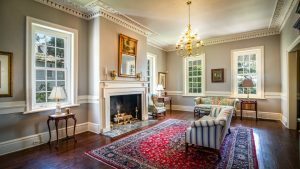 Georgetown, S.C. – The historic Stewart-Parker house in Georgetown, S.C. was recently purchased by Honolulu-based couple, Dr. Richard Price and fiancée, Ms. Carmen Campbell. The couple purchased the home–sight unseen, except online pictures–from Hawaii, only seeing the home in person for the first time at closing on February 15. 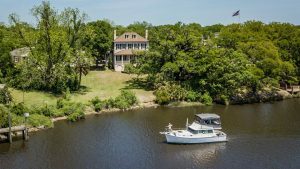 They have since relocated to Georgetown, S.C., and describe the experience as “meant to be.” The sellers, The National Society of the Colonial Dames of America in the State of South Carolina (NSCDA-SC), as well as the seller/buyer agent, Nancy Siau, and broker-in-charge, Kathy Besse, both of The Lachicotte Company, see the experience the same way. Dr. Price has always had an interest in historic homes and had been casually searching online for houses when he came across the Stewart-Parker estate. He and Ms. Campbell were intrigued by not only the beauty of the home, but also by the history of it. One of the oldest homes in one of the oldest cities in S.C., the Stewart-Parker house was built in 1740 by Robert Stewart. George Washington slept in the home during his 1791 tour. Dr. Price grew up in the Southeast, and Ms. Campbell has family connections there as well, so they always had an interest in returning to the area. Ms. Campbell notes that she feels “very connected to the Southeast, and had an immediate connection to the Stewart-Parker house. My family has roots dating back 12 generations in the south, and my mother’s maiden name is Stewart. I suspect we may have family connections to the original home owners.” However, after discussing at length, though they were both very interested, the couple decided to put off the idea of moving due to their current busy careers and Honolulu connections. Soon after, while on vacation, Dr. Price decided to look at the house online again, and to his and Ms. Campbell’s great disappointment, found that it was under contract. This was confirmation to the couple that they had more than a casual interest in this house – they decided then and there that if they ever had the opportunity to purchase it again, they’d take it. A short time later, the house appeared again online for sale, the previous contract having fallen through. That day, Dr. Price called the listing agent on the home, Nancy Siau, to submit an offer on the home. Siau remembers, “I’ve been in the real estate business for many years, and rarely have I had a purchase that is sight unseen. I could sense the excitement through the phone all the way from Hawaii. Dr. Price and Ms. Campbell are truly meant to be stewards of this estate. After Dr. Price saw the home for the first time, he was thrilled and told me he felt blessed to find South Carolina. It’s so nice to be able to play a small role in the history of the Stewart Parker Home!” Kathy Besse agrees, noting, “This was serendipity at its finest. 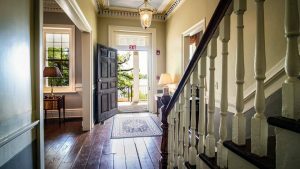 It was The Lachicotte Company’s sincere pleasure to be a part of passing the torch of ownership of this beautiful home to such great new owners.” Dr. Price and Ms. Campbell were delighted once the offer was accepted that they’d realize their dream of moving back to the mainland and into this historic home. 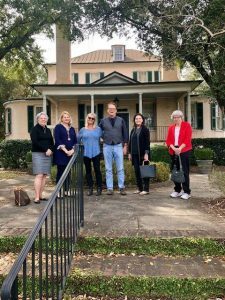 The NSCDA-SC, wanting to ensure that the historical architecture of the home stayed in place with new ownership, worked with The Historic Charleston Foundation prior to listing the property to ensure the home would be protected in perpetuity. The NSCDA-SC plans to honor the Parkers and help educate people about the role that Georgetown has played in the founding of our country with the proceeds from the sale. Dr. Price has officially moved from Honolulu to Georgetown, S.C., while Ms. Campbell is finishing up her Ph.D. in Biomedical Sciences in Hawaii and will soon be relocating as well. Dr. Price already feels at home in his new city, noting, “Georgetown is such a great community, and we’ve met such nice people since moving here. It’s a wonderful place. I hope that I can live the rest of my days here.” He went on to joke that his southern accent is already returning. The couple plans to have their wedding at their new home over the summer, and to work to restore the home while preserving its unique beauty and history. “I consider us caretakers of this house, and we are privileged to be a part of the home’s history,” says Ms. Campbell. “This house will still be here long after we’re gone, and we want to leave it better than we found it–not by ‘modernizing’ it, but by preserving it,” she adds. The couple is overjoyed at their new purchase and are inspired to find ways to continue integrating the home into the fabric of the city of Georgetown through education and philanthropy. About The Lachicotte Company: The Lachicotte Company was established in 1991. In 2012, two iconic Lowcountry families—the Lachicottes and Coopers–joined forces when The Lachicotte Company merged with Vintage Estates Realty. In 2018, the reins of the company were handed over to the four Cooper siblings–Gina, Christy, Chuck, and Gary–by Doc Lachicotte. As the Grand Strand’s exclusive affiliate for CHRISTIE’S International Real Estate and NAI Global, the full-service brokerage offers both Residential and Commercial Real Estate Services complete with Property Management. In addition, the Rental Division provides vacation planning and rental services, vacation home property management as well as long-term rental management and placement. For more information about The Lachicotte Company, visit www.lachicotte.com.